Jack Reacher - Emphasis on "Reacher"
No, seriously, he has a new film. 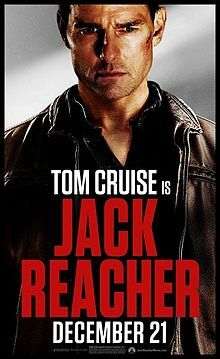 It's called Jack Reacher and is about a physically imposing, ex-Army detective who's six-foot-five and around 250 lbs. Cruise/Reacher: I can't see a damn thing in here. Pike/Helen Rodin: There's an overhead light, just above your head. Director (from offscreen): Cut! Let's just do the lighting and start from there. Cruise/Reacher: No way, man! (Jumping and missing again) I got this!! Cruise/Reacher: I guess I'll leave you gentlemen parked in here. Cruise/Reacher: Just a second. (Jumps and misses) (To director) You're going to love... (jumps and misses) the subtle scowl... (jumps and misses) I'm going to throw... (jumps and misses by six inches) these guys when... (jumps and misses badly) I pull... (barely jumps, breathing heavily now) this door... (bends over panting, his hands on his knees) (Offscreen) Can... Can I get a Perrier? Pike/Helen Rodin: So, I imagine you're quite a basketball player.